Producer(s) : Out to Lunch Productions Inc. It has taken decades for all of us to see the urgency of protecting the earth’s environment and the need to seek alternatives to fossil fuels. With this understanding and willingness has come new opportunities—some of them good and some of them not so good. For politicians, it provides a dynamic platform to convince voters of their sincerity and the pressing need to elect them. For business, it is a goldmine, potentially worth hundreds of billions of dollars. The green industry is the future and those that react quickly will benefit most. But like all gold rushes, this new industry is filled with not only sincere and honest champions, but also carpetbaggers and snake-oil salesmen. Nowhere is this more evident than with the massive development of industrial wind power. Big Wind is an in-depth documentary that covers the unprecedented rush to industrial wind turbine development that is transforming the landscape of Canada and the world. It is pitting neighbour against neighbour, residents against companies, and the government against its people. 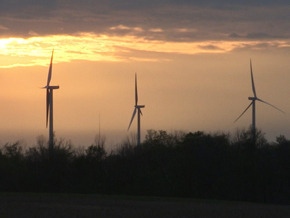 The film investigates why governments are spending billions of dollars on wind power without first doing health and environmental studies, why citizens are being stripped of their democratic process, why people are falling ill, why families are losing their homes and why politicians are turning a blind eye to foreign energy corporations that are gobbling up precious farmland. Are these so-called ‘green’ corporations actually friends to the environmental movement? Or do they have a more sinister agenda? Big Wind delves into the business and marketing of green energy, revealing much about the ways of modern democracies. It tells the story of unchecked capitalism, corporate welfare, the corruption of political systems, the enormous influence of lobbyists, and the power of the almighty dollar. Big Wind is also a film about ordinary citizens who have had enough and are taking on big government and big business. They are part of a growing revolution in the rural communities of Canada and many countries around the world fighting to defend their homes, their way of life and the environment against Big Wind. It is a battle that will impact the entire green movement, as well as the well being of Canadians and citizens worldwide for years to come.